U4 partner agency field offices and embassies can apply to host a U4 Anti-Corruption Resource Centre workshop. Each workshop is tailored to the local context. What guides each event is the information needs and challenges that donors and their development partners face. Hosting U4 workshops can help bring momentum to local processes by serving as a neutral platform for different stakeholders to learn and discuss. The application process for workshops in 2019 will start in mid-2018. Please await further information. 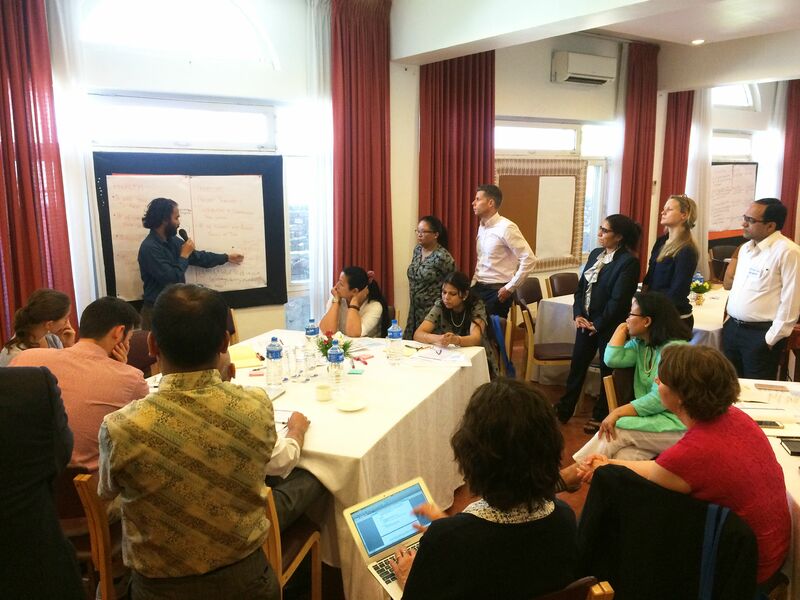 U4 in-country workshops are successful in facilitating local dialogue that might otherwise not have occurred. Participants include U4 partner agency staff and invited representatives from government, civil society, and other development agencies. We strive to approach all workshop topics from an operational angle, and engage the participants through presentations, discussions, and group work. Over the past decade, more than 2000 participants have taken part in our workshops with a consistent average satisfaction rate of around 90%. In 2016, over 94% of participants said they expected to use the new knowledge in their work. Participants discuss home-grown indicators for measuring the Sustainable Development Goals. U4 workshop in Nepal, May 2017. The U4 team’s more than decade-long experience of facilitating in-country workshops has taught us many unique insights. We see a real benefit of workshops that feed into longer-term plans – whether driven by host agencies or other country-actors. This approach improves the chances for sustainable workshop outcomes, and often leads to follow-up action. Former hosts often ask for further U4 involvement in local processes. We therefore always consider workshop outcomes as parts of a broader change process. Apart from our workshops serving as a neutral platform to bring different stakeholders to discuss key issues, the hosts can expect the U4 organiser to provide new information and raise awareness. We can also help the host agency communicate a message to participants. Through the process of planning, conducting and reporting on a workshop, U4 staff can also contribute to the host agency’s ongoing activities related to the workshop topic, for example by helping to inform or kick-start a new programme. The U4 in-country workshops form part of a package of services included in the U4 partnership. Our team members are full-time anti-corruption advisors who conduct the workshops together with speakers who have special insights or country-knowledge. We recommend that applicants suggest a maximum of two topics. We also offer collective donor responses as a half-day module. We can also shape all the listed topics to apply to post-conflict or fragile situations. Core concepts: definitions, explanations and drivers, and consequences of corruption, with an overview of integrity reform in the country. Strategic approaches to anti-corruption reform with a special focus on measurement and sector strategies. National strategy and policymaking for anti-corruption, including a holistic approach to collaboration between anticorruption institutions in a country. We are experienced in conducting this workshop with a post-conflict and fragile state focus. Additionally, some topics covered in this workshop are usually integrated in the other workshops. Assessing specific corruption risks in the justice sector. Overview of existing principles and normative standards for integrity and accountability in the justice sector. Identifying entry points to integrate anti-corruption approaches in justice sector reform. Provide participants with a clear understanding of the rationale for integrating anti-corruption approaches into sector work. Discuss when and how to integrate anti-corruption into sectors, exploring tools to identify corruption risks at the sector-level, considering how to set priorities and design context-specific measures to address those risks, and identifying monitoring and evaluation tools. Assist partners in identifying entry points to integrate anticorruption approaches into sector programmes and projects, and advise government counterparts on integrating anti-corruption into sector strategies and policies. We can tailor this workshop to the health and education sectors based on available curriculum developed in partnership with the International Institute for Education Planning – UNESCO and Boston University School of Public Health. How participants can identify and prioritise risks of corruption in the trafficking cycle (recruitment, transport and exploitation), as well as in the criminal justice response. Mitigating measures, with a view to establishing potential entry points for engaged donor action. Resource, climate, and energy governance-related initiatives, programming options, and research findings on risks. Options for anti-corruption engagement in contexts where the proper management of natural resources and energy – including for climate change related actions – is particularly important for achieving development objectives. How natural resource sectors link to the illicit financial- and commodity-flow agendas. Designing and implementing evaluations of anti-corruption projects. How to build monitoring systems, and use existing corruption measurement tools and global indices effectively. How to leverage social accountability measures to strengthen anti-corruption reforms in given sectors or contexts. How donors can collectively act in response to emerging corruption cases at the country level. The OECD Risk Management Guidelines, ISO standards and different forms and types of donor coordination. At a workshop on Strengthening the role of the Kosovan justice sector in fighting corruption in 2016, representatives and law enforcement agencies, the judiciary, civil society and international organisations and embassies in Kosovo gathered with a shared aim reducing corruption in Kosovo. The event created a timely and welcomed opportunity to take stock of achievements and remaining challenges and opportunities – particularly around inter-agency collaboration during the criminal justice process. At the end of the workshop, participants came up with suggestions for improved collaboration and learning, such as exchange of staff, regular inter-agency meetings and reinvigorating existing coordination mechanisms.